WE WILL NOW BE OFFERING FULFILLMENT! LIMITED SPACE AVAILABLE, IF INTERESTED PLEASE EMAIL DAVE@CBIUSA.COM OR CALL 716-282-7447. Ontario businesses and residents, start using CBI USA’s Mailbox Rental & US Shipping Address services. We offer the perfect temporary spot to store your US purchases until you’re ready to pick them up. Start saving money today! To access your account your username will be your initials and PMB number and your password is your postal code, no spaces. When you make online purchases, use CBI’s US Shipping Address as your Business or Personal US Mailing & Shipping Address. 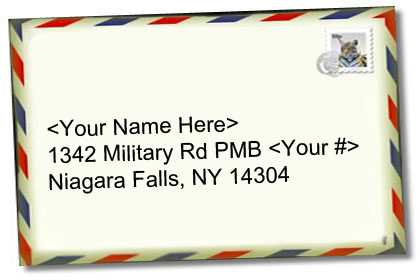 All you have to do is put your Name, your PMB#, and CBI’s US Shipping Address when asked to fill in shipping info. You do NOT need to notify CBI before shipping packages to the CBI warehouse. You can start sending items to our US shipping address today! Shipping valuable purchases? All items (packages, skids, vehicles, etc.) received & signed for by CBI include CBI's exclusive replacement guarantee (exclusions apply. Please review our FAQ section for full details. Do not trust your purchases with any less of a liability policy. **Oversize packages: If your package is over 70 lbs and/or 84 inches (length plus girth), there is an additional $5.50 oversize fee. Skids: $27 to receive & outbound a skid. And a $2.00 per night storage fee. Oversize skids larger than 48“x42“x48” are subject to additional handling & storage fees. FREE services: Customers can drop-off UPS/FedEx/USPS prepaid labeled packages for FREE. CBI also offers FREE faxing, internet, invoice printing, & recycled shipping materials. CBI is also an authorized UPS shipping center making us the low cost alternative to the UPS Store & Mail Boxes Etc. We are conveniently located near the Rainbow, Whirlpool, & Lewiston-Queenston Bridges in Niagara Falls, NY. Please be sure to check-out our new Deals page!